Amancio Ortega Gaona is a Spanish billionaire businessman. Ortega is the founder and former chairman of Inditex fashion group which is best known for its chain Zara clothing and accessories shops. He is the second-wealthiest person in Europe after Bernard Arnault. 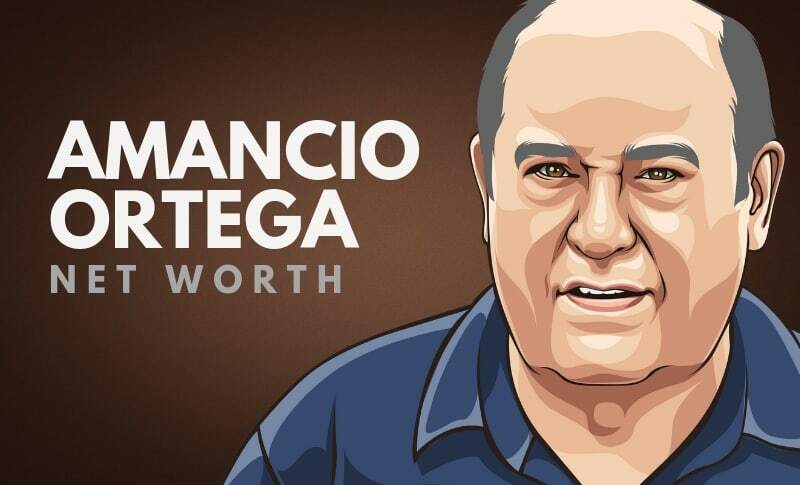 As of 2019, Amancio Ortega Gaona’s net worth is approximately 60.3 billion dollars. Amancio Ortega Gaona was born in Busongo de Arbas, Leon, Spain on the 28th of March, 1936. He is the son to Antonia Ortega Rodriguez and Josefa Gaona Hernandez. He mostly spent his childhood in Leon. Ortega left school t an early age and moved to A Coruna at the age of 14. Shortly after, he found a job as a shop hand for a local shirtmaker called Gala, which still sits on the same corner in downtown A Coruña. Manacio Ortega founded Confecciones Goa in 1972, to sell quilted bathrobes. A few years later he opened his first Zara store with his wife Rosalia Mera. In 2009, Zara was a part of the Inditex group of which Ortega owned 59,29%, and aside from over 6,000 stores included the brands Zara, Massimo Dutti, Oysho, Zara Home, Tempe, Pull and Bear, Bershka and Stradivarius. His public appearances in 2000, as part of the warm-up prior to his company’s initial public offering on the stock market in 2001 made headlines in the Spanish financial press. Ortega was, however, the only one who was ever granted interviews to three journalists. In 2011, Ortega announced his imminent retirements from Inditex, parents company to the Zara chain, stating that he would ask Inditex vice-president and CEO Pablo Isla to take his place. As of 2016, he owned around 60% of Inditex, which is the holding company for Zara and related chains. Most entrepreneurs are extroverts, but that is by no means necessary to succeed. Many great entrepreneurs are introverts and Amancio Ortega is one of them. Don’t be discouraged if you aren’t the life of the party, because you can still run a profitable business. Being successful in life doesn’t mean that you can’t still be humble and modest. In fact, having those traits can be extremely beneficial for both your professional and personal lives. Humility has been found to help us cope better with anxiety, become better leaders and workers, have more self-control, and be more willing to help others. Even though 10 years may seem like an eternity when establishing a business, it clearly paid off. Being patient gives you the chance to wait, watch, and know when to act in all aspects of your life. Instead of acting inappropriately or irrationally, with patience you can step back, regroup, and make the best decision possible. Amancio Ortega is one of the richest businessman and fashion founder in Europe. He is behind some of the most famous brands such as Breshka, Zara and Tempe. As of 2019, Amancio Ortega’s net worth is estimated to be roughly 60.3 billion dollars, making him one of the richest entrepreneurs in the world. What do you think about Amancio Ortega’s net worth? Leave a comment below.